Flexible polyvinyl chloride (PVC) accounts for 80–90% of global plasticizer consumption. Flexible PVC (and thus plasticizers) is found in the following applications: construction (flooring, wall coverings), electrical (wire and cable jacketing), consumer goods (toys, footwear, etc. ), packaging, transportation (inside and outside of vehicles), furnishings, and medical uses (tubing, blood bags). Continued global demand for flexible PVC will lead to continued growth for plasticizers. Demand for most downstream plasticizer markets is greatly influenced by general economic conditions. As a result, demand for plasticizers largely follows the patterns of the leading world economies. 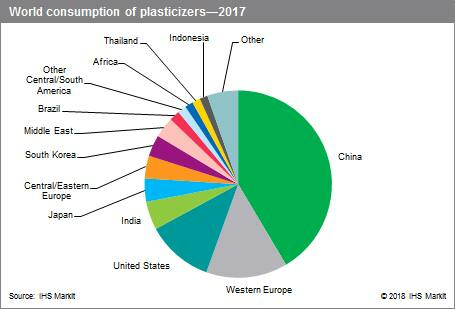 China is the single-largest plasticizer market in the world, accounting for nearly 42% of world consumption in 2017; it also has the highest forecast consumption growth during 2017–22, spurred by increased plasticizer consumption in goods for both domestic and export markets. Overall, global plasticizer consumption will grow at a rate of about 3% per year in the next few years. Phthalate esters, based on phthalic acid, are the main types of plasticizers used since they satisfy a broad range of processing and performance requirements, as well as a large number of markets. Major phthalates include di(2ethylhexyl)phthalate (DEHP), also known as dioctyl phthalate (DOP); diisononyl phthalate (DINP); diisodecyl phthalate (DIDP); and di(2-propylheptyl) phthalate (DPHP). World consumption of phthalate plasticizers is forecast to grow at an average annual rate of 1.3% during 2017–22. World consumption of lower-molecular-weight phthalates is forecast to decline in many regions as a result of replacement, mostly by nonphthalates. Nonphthalate plasticizers are not based on phthalic acid, and have a different chemical structure and toxicological profile. These include terephthalates (the most common is dioctyl terephthalate [DOTP]), epoxy, aliphatics, trimellitates, polymerics, phosphates, and others. There has been a continuing shift toward the use of nonphthalates, mainly because of increasing regulations on phthalates resulting from human health concerns. For example, global DEHP regulations have led to a phaseout of DEHP. Despite some challenges in terms of replacing phthalates, nonphthalates are expected to have stronger growth in the coming years. Nonphthalates are able to address some of the health concerns facing phthalates while meeting performance requirements. World consumption of other plasticizers (terephthalates, epoxy, aliphatics, trimellitates, polymerics, benzoates, and phosphates) is forecast to grow at an average annual rate of 5.8% during 2017–22. Terephthalates, epoxy, trimellitates, and some aliphatics (mainly hydrogenated phthalates) are forecast to grow strongly as they replace phthalates. In particular, DOTP will have strong growth across most regions. Phthalates will continue to account for most global consumption at approximately 60–65%; they will continue to be a large-volume driver for future demand.